SECSI » How do you know that this is not my correct email address? How do you know that this is not my correct email address? When I was traveling to Spain last year, I connected to the „free“ wifi network at BCN airport in Barcelona. They do not charge a fee for connections up to one hour. However, they collect some personal data to be able to use the service. 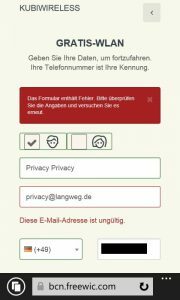 I stated my name as „Privacy Privacy“ and gave „privacy@langweg.de“ as my email address. While not being an email address I use, it is still a syntactically correct email address and it is one that is not rejected by my mail server. 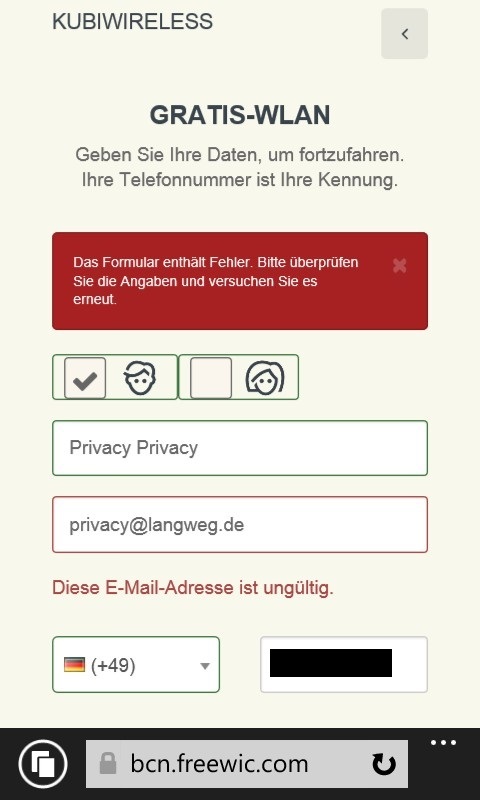 Nevertheless – the email address was rejected as not being valid. I wonder how on earth they determined that automatically. I dropped my wifi connection attempts at that point and used my slower 3G connection instead.